What does the Bible say about women's roles in the church? With pros and cons on either side of a heated, ongoing debate, no definitive conclusions have emerged. The purpose of this book is to furnish you, the concerned Christian, with a clear and thorough presentation of the two primary views on women in ministry so you can better understand each one's strengths, weaknesses, and complexities. Each view--egalitarian (equal ministerial opportunity for both sexes) and complementarian (ministry roles differentiated by gender)--is represented by a male and a female contributor. The writers all offer thoroughly qualified insights based on careful biblical scholarship and personal experience. At the end of each of the four essays, a brief question-and-answer section provides further clarification. 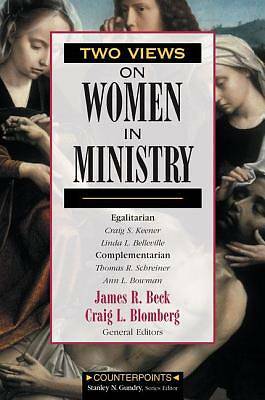 The general editors provide commentary at the conclusion of both hierarchical and egalitarian sections, and in the final appendix editor Craig L. Blomberg supplies thought-provoking insights into how the apostle Paul treats gender roles in his writings.By furnishing you with current perspectives from both sides of this controversy, Two Views on Women in Ministry helps you draw and support your own informed conclusions.